If you want to purchase high quality, beautiful baby lovebirds as pets, this is the right place for you! 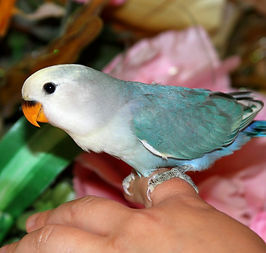 We are home-based lovebird breeders that produce a diverse selection of rare, adorable lovebirds. Click on the Lovebirds for Sale tab to see the color variations we have available! To help you better understand the process of becoming a lovebird owner, we have provided some tips on buying and preparing for a lovebird, as well as information on its diet and health. We offer short term boarding as well as gender-determining DNA tests. We breed a diverse selection of hand-fed, adorable baby lovebirds. All of the babies are given as much love and care as possible. Please browse through our Gallery and email us to make a reservation on the color variation you like. The Lovebird for Sale tab shows the babies we currently have available.